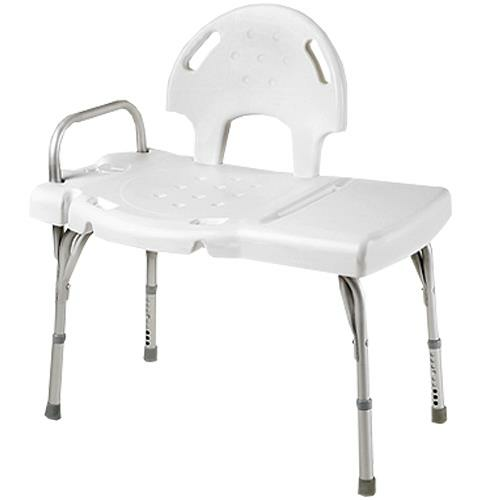 Invacare I Class Heavy-Duty Transfer Bench is designed to help make transfers in and out of the bathtub safer and more comfortable. It features a textured seat with drain holes, built-in soap dish and hand-held shower holder, which make this Transfer Bench a must-have for bathing peace-of-mind. Push the tabs on the bottom of the back into the holes in the seat until the compression buttons are completely visible through the notches on the back of the seat. 1. Position the seat and leg frames together upside down on a level surface (snap buttons facing inward). 2. Attach the leg frames to the seat with mounting screws. 1. On the end of the transfer bench with the soap dish, remove and retain the hardware that secures the seat to the leg frame. 2. Position the seat arm against the leg frame and into the slots in the seat. Thread the mounting screws through the seat arm, the leg frame and the seat support. Secure all in place with two locknuts.